Boxing is not for the faint hearted, but imagine taking up the sport after a heart transplant. A 21-year-old from Enniskillen who went under the knife six months ago is doing just that and has thrown his hat in the boxing ring. The Fermanagh Herald reports that Lee McDonnell has made remarkable progress and is inspiring the locals with his new found enthusiasm for the sport. Speaking to the newspaper, Mr McDonald said he is taking his recovery in his stride. "I'm actually very relaxed and laid back," he told the Herald. "If something comes my way I take it as it comes." In sadder news, coverage of the funerals of Lauren Bullock, Morgan Barnard and Connor Currie are mentioned in most of the local newspapers. The three teenagers died after a crush at the Greenvale Hotel in Cookstown. Hundreds of young people were queuing to get into a St Patrick's Day disco. 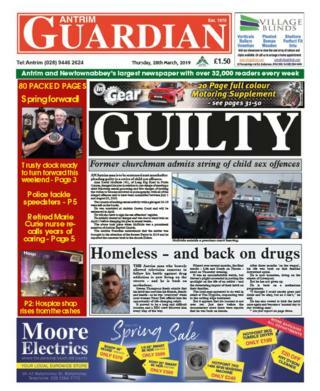 The Mid-Ulster Mail spreads its coverage out over six pages, covering each of the their funerals. Speaking at the funeral for Morgan, 17, Archbishop Eamon Martin described the anguish felt by relatives and friends of the children. 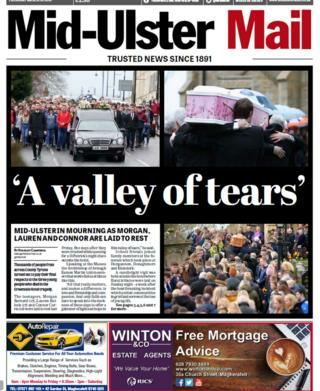 The Mid-Ulster Mail titles its front page "Valley of Tears", and reports that thousands across County Tyrone turned out to pay their respects. The head of the Catholic Church in Ireland said a "valley of tears" was caused by the deaths. 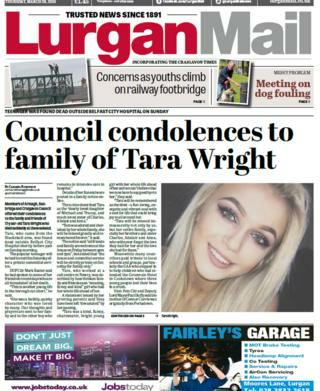 Meanwhile, the Lurgan Mail leads with the death of Tara Wright, the teenager who was found dead near Belfast City Hospital. Police believe the 17-year-old's death is connected to a single-vehicle crash on the outskirts of the city on Sunday. The Lurgan Mail publishes condolences offered by the members of Armagh, Banbridge and Craigavon Council. DUP councillor Mark Baxter said he had spoken to some of her friends in recent days, who are all "devastated" by her death. Tara's parents issued a statement saying she was a "vibrant soul with a zest for life that could bring joy to all around her". The Down Recorder covers the funeral of a mother-of-three who died after she went missing during a hen party in Carlingford. Ms Maguire's coffin was carried by her fiancé Jim Griffin and others. She was buried in her wedding dress at Carnmoney Cemetery following a funeral at St Vincent de Paul Church, Ligoniel. The first ever UK Stroke Assembly to be held in Northern Ireland will be in Cookstown's Glenavon House Hotel, according to the Mid-Ulster Mail. The event brings together people affected by strokes to have their say and influence future campaigns, share experiences and hear the latest developments in stroke care and research. Cookstown stroke survivor Derek Short, who had a stroke in 1999, has campaigned for years to bring the event to the area. The 76-year-old is the founding member of the Mid-Ulster Stroke Support Group. A County Antrim church, which lost out in the final of a BBC restoration series, has finally been restored. The Cushendun Old Church will be turned into an arts, heritage and community space, the Coleraine Times reports. The building will also be open year-round as an information and mini-heritage centre where visitors can learn about the area. Cushendun Old Church represented Northern Ireland in the final in "Restoration" in 2006, which was won by a 19th century wheelwright and blacksmith's workshop. It was one of eight UK finalists hoping to attract crucial funding to save them from ruin. Police have warned any history hunters to stop digging up buried treasure on local land, the Fermanagh Herald reports. The newspaper says that the police has issued an appeal following claims metal detecorists were illegally digging up land at historical spots around Fermanagh. According to the police, people have been entering estates like Tully Castle and Monea Castle to dig up the grounds in search of "treasure". 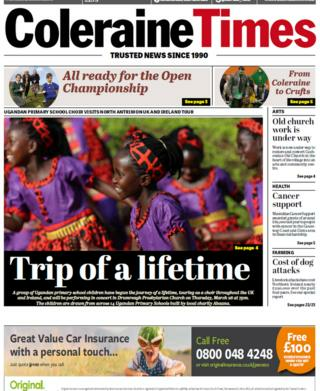 The Coleraine Times has a follow up on its report on livestock attacks. The newspaper previously said such attacks have cost Northern Ireland nearly £290,000 over the past four years. Data it has compiled shows there were 145 dog-worrying livestock incidents reported to police in 2018, up by six incidents from 2017. The peak time for attacks is from January to April, during the lambing period. 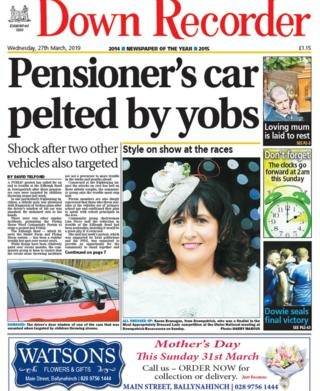 A group protesting in Downpatrick has called for an end to trouble on the Killough Road after three pensioners cars were targeted by children throwing stones, the Down Recorder reports. According to the report, in one incident an elderly man was showered with fragments of broken glass after the driver's-side window of his car was smashed. Community group chairwoman Lisa Perry said that the protest was an opportunity for people in the community to stand together.